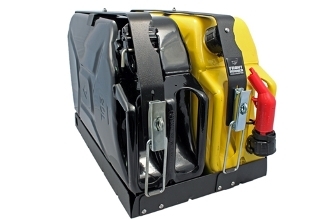 The Front Runner universal double Jerry Can holders offer a no rattle, no wear solution. The adjustable locking steel clasp means your Jerry cans will be secured firmly in place over a lifetime of offroad abuse. A new bolt on top clamp, provides less hassle when removing Jerry cans. In addition, the steel strap downs cover the jerry can caps. Add your own padlock and you'll never have to worry about stolen fuel while on the road. Includes spacers for use with some of the new Carb Compliant Jerry cans. The Front Runner Double Jerry Can Holder is made of black powder coated stainless steel and is designed to easily bolt to the Front Runner Roof Racks using the flat slotted slats in the rack. The Double Jerry Can holder can be bolted to any flat surface and can be used in a wide variety of applications such as mounting to pickup truck beds or other brand roof racks. Holds two (2) 20l (5.3 gallon) NATO/Wedco style military cans with the offset spout (including Carb Compliant Versions). Also fits the Front Runner Plastic Water Jerry Can with Tap. Comes complete with holder and all necessary bolts to secure to the Front Runner Slimline Roof Rack. Bolt on design allows this to fit to almost any roof rack or flat surface. For use with 20 litre (5.3 gallon) NATO/Wedco style military cans with the offset spout (including Carb Compliant versions). Also fits the Front Runner Plastic Water Jerry Can with Tap.